Here’s one thing you’ll always need: a backup plan. 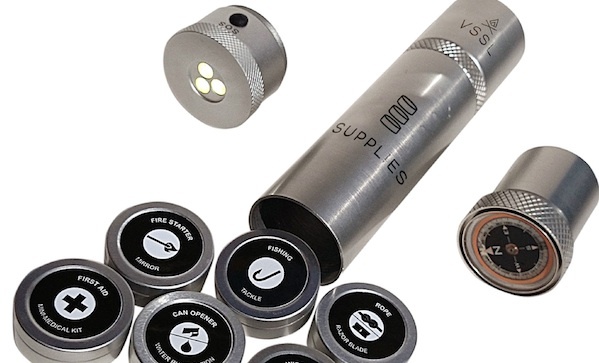 Don’t care who you are or where you’re going, you need a backup plan, and if you happen to be headed to the woods, your plan can partly consist of carrying these VSSL survival supplies ($89). It starts with a neat case that’s an LED flashlight on one end and an oil-filled compass on the other end. Inside there are a bunch of weather proof cases that contain: a 4 hour pure Canadian beeswax candle, a razor blade, 6 Aquatabs® water purification tablets, a wire saw (high tensile, 60lb working strength with handle straps), an aluminium beadless emergency whistle, waterproof matches, tinder Quik® fire starters, fishing gear, a signalling mirror, Kevlar® rope (150lb breaking strength), reflective trail markers, a P38 military GI Type can opener, and first aid supplies. Throw in a map of wherever you are and you’ll be good to go.